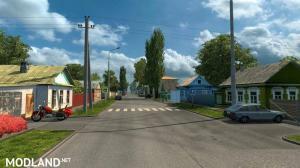 already connected Rusmap with DLC within Realistic Russian highways mod. But I got a request to release only connection. So here it is. but, unlike his connection, I kept Rusmap’s content as much as possible, so you won’t have long roads with only forests. Also, you won’t notice a height difference between DLC and Rusmap.